Leaky Shed Studio: A quick tags project! Hi there, Maggi here with today's quick little project! Its that time of the year when quick is always a good thing and practical is even better! Of course I ran out of gift tags when wrapping gifts so the debate was whether to run to town or make my own. It wasn't much of a debate since it was pouring down rain and who wants to go out in that? Mind you, I am not complaining since so much of the country is suffering from ice and snow storms. So I thought about this package of blank tags from Leaky Shed that I have and thought they would be just the perfect size for making To/From tags! I gave each tag a quick coat of paint with Viva Maya Gold paint as a starting point. (This is wonderful paint, it has a metallic base and sparkles so pretty.) 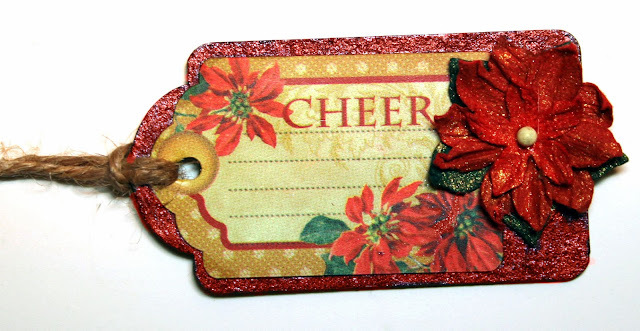 Then I rummaged around and found some little stickers and tiny Petaloo poinsettias and adhered to my tag and presto, a cute little gift package tag! I fussy cut the gingerbread man and popped him up, added a couple little stickers and doodled around the edges with a white Sharpie paint pen! 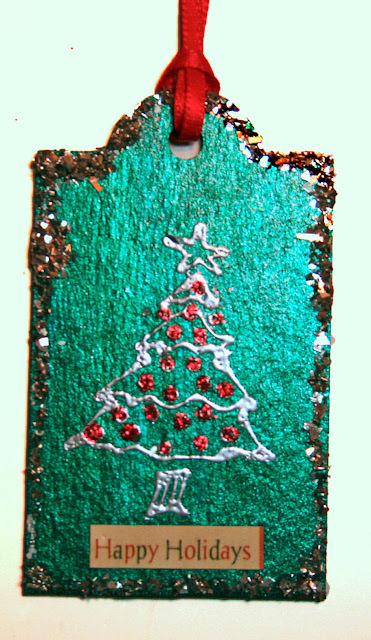 I stamped the Christmas tree image and sprinkled with silver embossing powder, added some red stickles for the ornaments, and then added glass glitter around the edges. 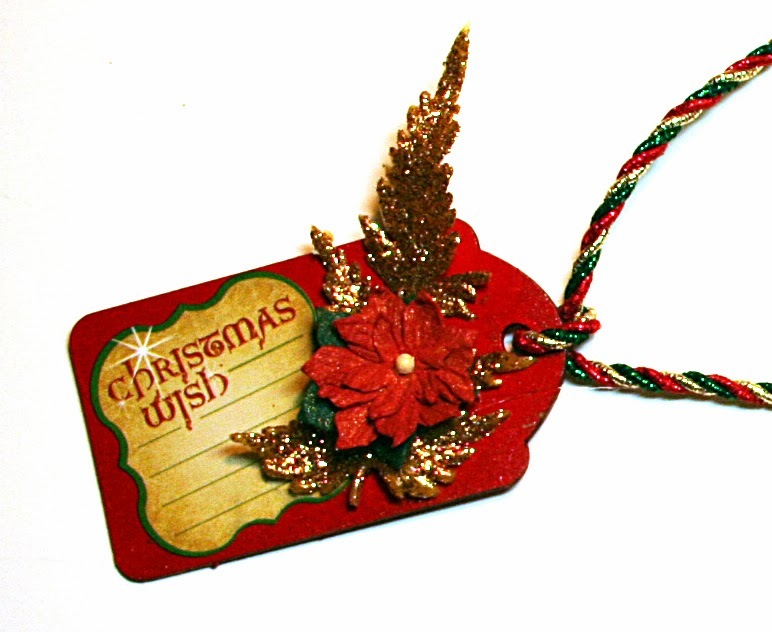 Another one done with a sticker, poinsettia and a bit of glittered foliage from Michael's floral department. 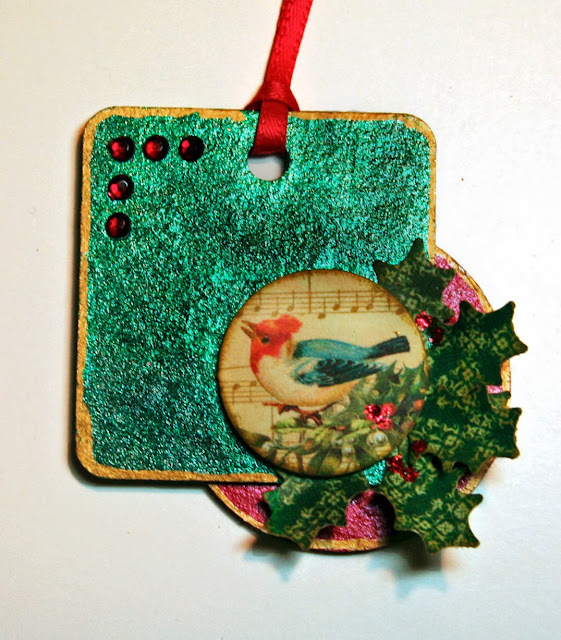 On this one I glued and offset a round tag behind the square tag just to add a little interest. I used a Martha Stewart holly punch for the foliage and outlined with a gold pen. So time invested? About a half hour! That's my kind of project for this time of year when there's so much to be done! I am sorry for the poor quality photos, it's been gloomy and rainy here for the past several days and its still raining! 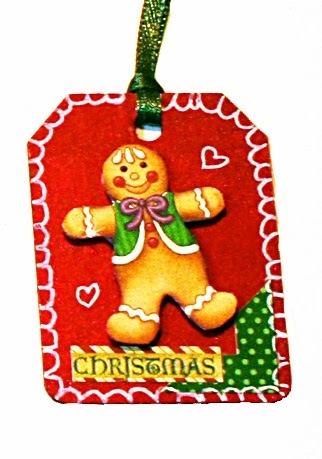 The camera is picking up the sparkle highlights in the paint and making it appear rough when actually it is a smooth beautiful finish like the red on the gingerbread man tag. Maggi these are so cute and perfect for the season! What a cute idea! Love the glitter!!! Wow wow wow!! These are gorgeous! I loveeeeeeee the colors and the textures!!!!! !